Through six fall shows Stony Brook University sits in second place within the Region 4 team standings. 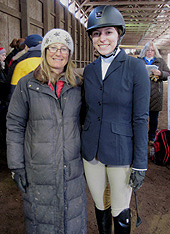 Head coach Myrna Treuting (on left) saw only one of her Seawolves qualify for Regionals through the first five shows. That rider is Kimberly Pokstis (on right), a sophomore from Warwick, New York who will show in both novice divisions at Regionals on March 31st. There was quite a gap between IHSA rides for New York University senior Fernanda Gonzalez Blanco (pictured). She was abroad in Paris all of the 2017-18 school year but in her first ride in two seasons Gonzalez Blanco won her novice over fences on October 7th. 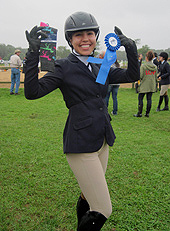 From Houston, Texas, Gonzalez Blanco strikes a pose with the socks she received along with the blue ribbon. NYU is only a point behind Stony Brook for second overall headed into the Adelphi/Pratt Institute show on March 10th. 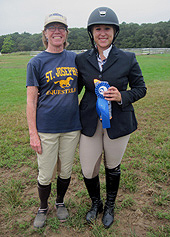 Seen here with coach Allison Mooney, Amanda Ferrone of St. Joseph's College (on right) is another Region 4 rider headed to Regionals in multiple divisions. From Ronkonkoma, New York, Ferrone is qualified in both intermediate divisions. Coach Mooney was one of many who schooled horses prior to the start of the St. Joseph's show on October 7th when this photo was taken. Molloy College has an assistant coach in 2018-19 and her name is Vicki Ryan (on right). 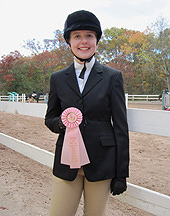 Some who follow Zone 1, Region 1 may know of Ryan because she was a member of the University of Rhode Island equestrian team. 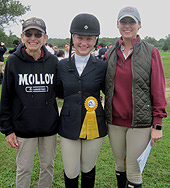 Head coach Carole Gerrity (on left) and Ryan pose here with Julia Kraemer (center) after the Molloy sophomore from Farmingdale, New York was third in walk-trot-canter at the October 7th St. Joseph's show. Kraemer has since pointed out of the division to become the first regional qualifier since Ryan came on board. Seen here at the March 11, 2018 all-region show at Country Farms, Rachel Evans is the first Suffolk County Community College rider to qualify for Regionals in 2018-19. The sophomore from Smithtown, New York has secured a ride on March 31st in the intermediate flat class at Regionals. Though the team was inactive 1998-2012 the re-born SCCC team is only four points out of second place behind Stony Brook through six fall shows. Through five fall shows five different teams could claim that only one of their riders was qualified for Regionals. 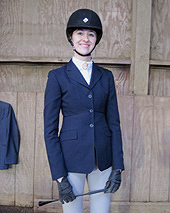 One of them is Hofstra University and their qualified rider is Hannah Matuszak (pictured). From Cincinnati, Ohio, Matuszak is seen here at the November 2016 NYU/Princeton show. The Hofstra junior is qualified in walk-trot-canter. Long Island University - C.W. Post College has put some space between themselves and the rest of the Region 4 field to say the least. After six fall shows LIU-Post was 100 points ahead of current runner-up Stony Brook in the Region 4 team standings. Backtracking to November 4th the Pioneers had 13 riders qualified for Regionals (the rest of the region combined had as many) including Trina Aspenleiter. 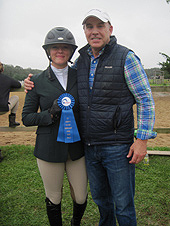 Seen here with first year assistant coach Frank Dimarsico, Aspenleiter is headed to Regionals in the intermediate flat division. And did we mention LIU-Post has seven of the top ten riders in the Region 4 open rider standings? Schools competing in Zone 2, Region 4 during the 2018-2019 school year: Adelphi University, Columbia University, Hofstra University, Long Island University - C.W. Post College, Molloy College, New York University, Pratt Institute, Princeton University, St. Joseph's College (NY), Stony Brook University and Suffolk County Community College. The March 17th show was cancelled. Show Schedule subject to change.